Credit: Pixabay/ColiN00B. CC0 Public Domain. Just like economists, political scientists have a poor record of predicting the future, whether it’s the fall of the Berlin Wall, the victory of Trump, or the timing of a UK general election. They might be even less able – or willing – to foresee that a more significant change is on its way: the demise of representative democracy itself. Across the globe, but particularly in the Western world, we are witnessing the erosion of confidence and trust in government and traditional political parties, a long-term decline in voter turnout, and deteriorating faith in democratic norms. At the same time, anti-system, populist politicians like Marine Le Pen are stepping in to offer apparent solutions to issues where the existing system has seemingly failed to deliver on its promises, ranging from job insecurity and inequality to migration and terrorism. How can democracy save itself from this impending failure? What would it take to create a new era of progressive democratic renewal? I believe the best chance we have of moving forward starts with looking back to ancient philosophy. More specifically, at least part of the solution lies in one of the most potent and popular philosophical ideals in Western cultural thought: carpe diem. Sounds unlikely? Let me explain. Carpe diem or ‘seize the day’ is a phrase that goes back to the Roman poet Horace. In a poem he wrote in 23 BC he declared that, “Even as we speak, envious time flies past. Seize the day and leave as little as possible for tomorrow.’” Since then his two-word Latin motto has become a dominant cultural meme which generates over 25 million online search results and has spawned imitation catchphrases like the Nike slogan ‘Just Do It’ and the social media hashtag #YOLO (‘you only live once’). Dig a little deeper, however, and a more nuanced picture begins to emerge. In the process of writing my new book Carpe Diem Regained, I worked with a research team to look at how terms such as ‘carpe diem’ and ‘seize the day’ have been used in everything from contemporary newspapers to Reformation church sermons. After analysing hundreds of original sources going back to the sixteenth century, a fascinating pattern became clear: there have been four essential interpretations of these phrases through the centuries. The most popular form of carpe diem I call opportunity, which concerns taking windows of opportunity that may never be repeated, whether it’s the career break of a lifetime or the chance to rescue a failing relationship. A second approach is hedonism, where we seize the day through sensory pleasures, from free love to gastronomic exploration. Another is presence, which includes entering the present moment mindfully through methods such as meditation, but also extends to more vigorous activities such as the intense rush of extreme sports or getting entranced in dance. The fourth is spontaneity, which involves throwing plans and routines to the wind and becoming more experimental in the way we live. I’m the first to admit that this quartet of approaches to seizing the day doesn’t appear very political (although Theresa May’s decision to call a snap election in Britain is an exemplary case of seizing a window of opportunity). Indeed, carpe diem has typically been conceived of as an individualist philosophy applicable to private rather than public life. In my view, however, there’s also a fifth form of seizing the day: political carpe diem. This is not a term that you’ll find in any political science textbook, but it deserves to be. I define it as a strategy for political change based on mass popular mobilisation which harnesses all four forms of seizing the day and takes them to the collective level in an effort to achieve more influence. Throughout history we have seen social movements exhibiting and energised by such traits. Take, for instance, the Global Justice Movement in the early noughties, where ‘carnivals against capitalism’ in cities such as Seattle, Genoa and London were full of seize-the-day spirit. They were not just about seizing opportunities on a collective scale, but were full of spontaneous mobilisation that brought protesters into the present moment and displayed plenty of hedonistic revelry alongside serious political intentions. Remember all those activists in pink tutus taunting the police with feather dusters and dancing to the beat of samba bands? That was political carpe diem in action. It’s as if they had Horace whispering in their ears. But how relevant is political carpe diem today? Can it really help us stand up to the rise of far-right extremism and inject democratic politics with new vigour? Although contemporary politics is overshadowed by the emergence of anti-system, anti-democratic actors, a more hopeful development is also evident: we are immersed in one of the most dynamic periods of public protest action ever recorded, on a par with momentous periods such as the 1960s. We may find it hard to notice this as we go about our daily lives, but the evidence is overwhelming. 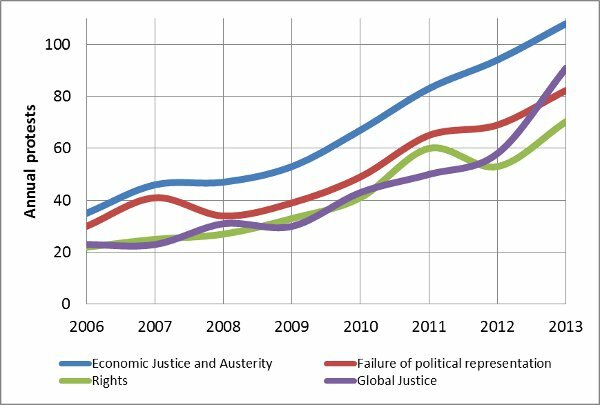 A study at Columbia University of over 800 protests in more than 80 countries revealed a steady rise in the number of mass protests since 2006, with the majority focusing on economic justice and anti-austerity issues. Some have been amongst the largest protests ever known: 37 of them, in countries such as France, India and Chile – gathered crowds of over one million people. What’s striking about these protests is how many of them display a carpe diem personality. I’m thinking here of movements like Occupy, which in September 2011 spread rapidly from Wall Street to 951 cities in 82 countries. I’m also thinking of the protests of the Podemos citizens’ movement in Spain, which grew out of the carpe diem activism of the Indignados – the indignant ones – who took over the Puerta de Sol in Madrid and other public spaces. Then there’s Hong Kong’s Umbrella Revolution, and most recently the pink hats of the anti-Trump Women’s March in 2017. So many of these ‘networked social movements’ as the sociologist Manuel Castells calls them have inherited the carpe diem spirit that goes back to Horace. Of course, not all of them are on the progressive, anti-authoritarian left. On the right the Tea Party also displayed plenty of seize-the-day traits, with their members dressing up in eighteenth-century colonial gear and wearing hats with teabags hanging off them. But the real heartland of carpe diem politics is the new landscape of networked movements fired by the ideals of social justice, democratic values and progressive change. I believe that today’s grass roots movements, campaigning on issues ranging from far-right extremism to climate change, will boost their possibilities of success if they can tap into the potential of collective carpe diem activism. Yet they face three major challenges. The first is that carpe diem politics could encourage mobilisation at the expense of organisation. Drawing people onto the streets with clever social media strategies is all very well, but as Paul Mason observes, “horizontalism can stage a great demo, but does not know what it wants”. There is no substitute for the kind of serious grass-roots and neighbourhood organising that has been so vital to successful social movement action in countries like Spain. A second problem is that they might focus too much on creating community spirit and not enough on challenging the state. This was, perhaps, the fate of the Occupy Movement. Yes, it was successful in catapulting the issue of inequality onto the public agenda through its ‘We are the 99%’ slogan, but Occupy failed to issue concrete demands such as radical tax reforms or new rules limiting corporate funding in politics. They would have had more impact if they’d dropped their ‘Occupy Everything, Demand Nothing’ mantra and adopted a few clear policy aims like the 1970s feminist movement, which campaigned on specific issues like equal pay and reproductive rights. The final obstacle is that changing politics through social movement action is an undoubtedly challenging pathway compared to traditional routes such as electoral politics. How many of us have gone on marches with tens of thousands of people, only to be completely ignored by the politicians? This is as relevant today as it ever was in the past. If there is any hope of forging a progressive alliance in the upcoming UK general election to confront Theresa May’s blinkered pursuit of Brexit-at-any-cost, then it will take a mass carpe diem movement of citizens on the streets to really make Labour, the Liberal Democrats and the Green Party sit up and listen. Social movement action will never be enough on its own to create change. We need other strategies too, such as cementing social bonds by encouraging traits like empathy, and offering new economic visions to inspire us. But we would also be wise to put our faith in Horace. The moment has come to forge a new democratic era where we shift from the singular carpe diem to the plural carpamus diem – let’s seize the day together. 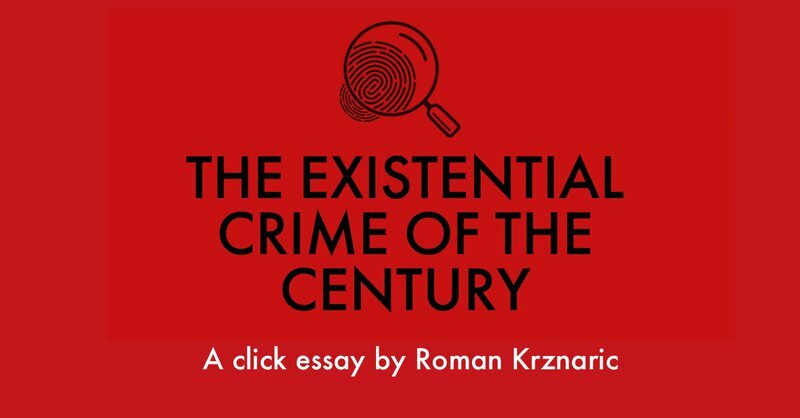 Roman Krznaric’s new book is Carpe Diem Regained: The Vanishing Art of Seizing the Day.